With more apps going into Apple's AppStore, it’s getting increasingly important to rank apps properly, highlighting the titles that are better than the others. 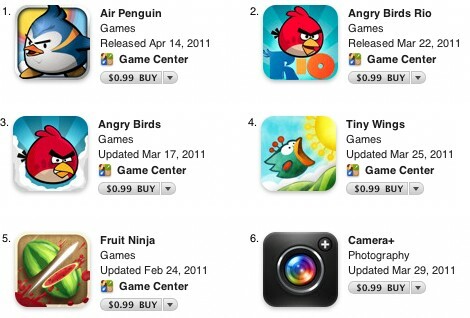 Apple knows this and is working to improve ranking algorithms as we speak. According to app-marketing firm Fiksu, the Cupertino-based company has been revamping the criteria it uses to rank digital products. They have apparently discovered two very important changes to the ranking algorithm: Rankings now take into account user ratings, and a change in how often the App Store updates the top-seller lists. The first tweak is arguably more important as it will push apps and games with better reviews up to the top. On the other hand, if an app under-delivers (compared to what’s promised in the app description), users will take notice, give it a low rating and make it slide down the rankings. The second change alters how often the App Store updates its rankings from every 15 minutes to every three hours. In other words, if an app scores a bunch of downloads in 15 minutes, it won’t fly up the top quickly. Rather, the algorithm will take notice and keep following the number of downloads for up to 3 hours before doing anything about it. It is believed that these two changes alone will help recommend better apps and games to the end users. Sage One small business invoicing, accounting and project management. Sage One was launched in the United States in the spring of 2012. Since then it has seen several enhancements. Among the added enhancements is the ability to accept mobile payments and electronic payments on invoices, as we reported in February. The company also added bank integration this year. Customers can now download transactions from over 10,000 banks in the United States and import them into the Sage One online system (avoiding manual keying of data for each banking transaction). 3. Your account will be updated to a from a 15-day trial to free 6-month account.